NEW YORK (CNNMoney.com) -- New home sales rebounded in June from the record low hit the previous month but remained sluggish. New home sales increased 23.6% to a seasonally adjusted annual rate of 330,000 last month, up from an downwardly revised 267,000 in May, the Commerce Department reported Monday. Sales year-over-year fell 16.7%. The June sales pace is the second slowest ever on record since the Commerce Department began tracking the data in 1963. But it was slightly better than the annual rate of 310,000 economists were expecting, according to a consensus survey by Briefing.com. "While the increased rate was positive, it's a bit of a head fake based on the decline we had with May's lower revision," said Anika Khan, Wells Fargo economist. "And if we look at other indicators, like mortgage application volumes and builder sentiment, we can see that the housing market remains very weak. Home sales had surged in March and April as homebuyers scrambled to sign contracts ahead of the April 30 deadline for the tax credit. But sales plummeted 40% in May, the first month after the incentive expired. Khan said the end of the tax credit will likely trigger a couple more months of "payback," but then the housing recovery will pick up, though at a snail's pace. "We're coming from extremely depressed levels, so it will probably be another two years before we get to a point where we see anything even vaguely close to a normalized rate," she said. Khan added that the factors that will continue to stall the recovery are added tight lending practices, rising foreclosure and delinquency rates, and a sluggish labor market. Price and inventory: The government report showed that the median price of new homes sold in June was $213,400, down 1.4% from May and a 0.6% drop from June 2009. An estimated 210,000 new homes were for sale at the end of June, the lowest inventory level in nearly 42 years. At the current sales pace, the government expects it will take 7.6 months to sell through that inventory, down from 9.6 months in May. Six months of inventory is considered normal market conditions. Sales by region: Sales rose the most in the Northwest, where they surged by more than 46%; the South saw sales climb by about a third, while sales in the Midwest increased 21%. 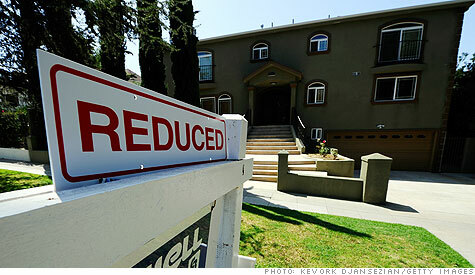 Sales in the West, the only region to suffer a decline during the month, edged down almost 7%.